30A Hooley Road, Midvale, Perth WA. Welcome, come on in and let us find you a costume to dress up the party. We stock both adult and children's costumes and can fit any shape or size, from petite to plus. As well as our comprehensive range of fancy dress costumes we also stock all the necessary accessories and accompaniments to complete your party look. Check out our full range of masquerade & Halloween masks, face paints, wigs, corsets, hosiery and hundreds of costume and party accessories. Our service is second to none and we endeavor to create the look just for you. We stock most popular items and create most of our mascots and costumes in house to ensures quality and originality. All our costumes are well cared for and clean. A local Perth family owned and run business, we have been in the industry for 15 years and have recently moved into our new shop in Midvale near Midland in Perth. We hope you enjoy your experience with us and come back time and again. Specialty Orders are available on request. Time and Price conditions apply. 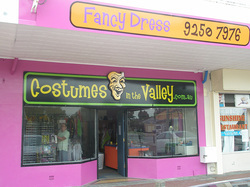 Costumes Midland, Mascotts, Lingerie, Perth, Retail, Costume hire.